When you need to make a great impression on potential or existing clients in your upcoming presentation, you will want to be sure to use a report cover that represents your business' most important ideals and evokes trust. It may sound a bit silly, but you want to take the time to choose a binding cover that these clients will enjoy. Because they're not just going to look at it; they will also be touching it, flipping through the pages, and taking it with them when they leave. So choose a report cover that will leave a lasting impression. • Custom Binding Covers: The best way to impress a client and to professionally display your company to your clients is with a custom printed binding cover. These one of a kind cover pages can be personalized in nearly any way, including with your business information and slogan, cut out windows to show a portion of your 1st page, special sizes, punching, pockets, and even full color photographs. We can customize any of our cover sheet materials to get you the finished look that you desire. The minimum requirement for custom covers is starting at just 1 box (100 covers). Call us at (866)537-2244 (866)537-2244 for a custom cover quote. • 5-Second Hard Covers: These premium wrap-around hard covers require no punching, and can be put together in only a few seconds. They are affordable, fast, and your client's will never know just how little time and money you actually spent. Called Pinchbooks, they come in either a linen textured cloth or a faux vegan leather cover option, and with or without a window. There are also many sizes that are stocked for quickly shipment, so you don't have to wait for customization. A very high value option, these Pinchbook hard covers are a great option for any business who wants to present a premium look, even though they may not have the time or resources to do so with traditional options. • Vinyl Binding Covers: These soft and supple report covers are our most popular option. They offer a premium thick feel, while still being flexible and affordable. There are several stocked sizes as well as some with and some without a window cutout option. A selection of professional colors can match most businesses well. Most users will pair these with the matte frosted poly covers (below) but many use them as both front and back covers. They are 15pt thick, and even sturdier 17pt vinyl covers are also available. • Poly Matte Frosted Binding Covers: These frosted clear binding covers are our most popular clear cover option. They are thicker than standard acetate covers, so offer a more professional and expensive look. Plus, the frosted look gives a nice appeal compared to traditional gloss, while also reducing any glare from your office lights. You can choose between 12 mil or 20 mil options. • Clear Matte/Gloss Binding Covers: The matte gloss clear covers are a close 2nd place as far as popularity. One side of the cover is smooth matte while the other is glossy, which offers a nice contrast of look and feel. They are available in a 10 mil thick and a several cover page sizes. They are vibrant, soft, and look more expensive than they are. • Clear Gloss Acetate Binding Covers: Clear gloss covers, also called clear acetate, are a more traditional cover sheet. When most people thing of a clear front cover, this is what they picture. They some in several sizes, and even several thicknesses including light weight 5 mil, medium weight 7 mil, and heavier weight 10 mil. The glossy finish on both sizes of this cover page help enhance color and contrast of your first page. They are also very affordable, so even small businesses with limited budgets can achieve a quality report. • Linen Binding Covers: These 80# paper covers have a textured fabric look to them that is lovely and classic. The cross-hatched look of these linen weave binding covers is appealing to businesses of all kinds, and offers the appeal of quality, while the price remains low. Linen covers are a bit different in that they are packed with 200 per pack, rather than 100 like most of the other covers. That is because most users who buy linen report covers use them as both front and back covers, so we sell them in sets. If you choose the window covers, you receive 100 with window and 100 without, for 200 total sheets and 100 total sets. • Embossed Grain Binding Covers: Embossed paper covers, sometimes also called sturdy grain, are made of an 80# paper stock with an upscale textured design on the front, and a smooth finish on the back. They feature a very light coating for added durability and to elevate the look. These paper presentation covers come in several colors and sizes. You can also choose with or without a window. Just like the linen covers, there are sold in a pack of 200 total covers, or 100 sets. 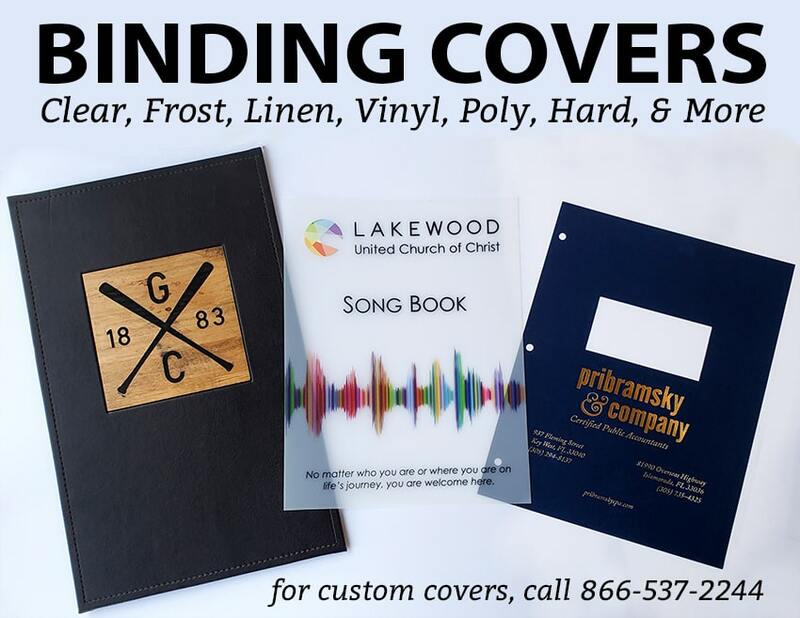 • Poly Leather Binding Covers: Poly leather cover stock offers the flexibility and durability of a poly plastic cover, but with the premium look of a leatherette cover. Textured on one side and smooth on the other, these dual-purpose report covers give you the versatility you need for work presentations, reports and more. Available in black or navy blue cover sheets, poly presentation covers are modern and professional. They come in either a 16 or 20 mil thick. • Poly Sand Binding Covers: Poly covers are extremely durable and tear-resistant, and can even be wiped clean if they get spilled on. You can buy them online in either a 12 or 16 mil thickness and can choose from popular colors. This particular plastic cover stock has a sandy-textured finish on one side, and has a smooth finish on the other. Poly sand cover stock offers a modern and professional look that is perfect for presentations and reports of all kinds. • Clear Matte Suede Binding Covers: Clear matte/suede report covers are a unique alternative to traditional clear gloss and clear matte covers, as they feature a textured finish, whereas the other covers are smooth to the touch. The finish is often called an orange-peel texture, and will help reduce glare and add a unique touch that can help set you apart from the crowd. The texture does not affect the translucency of these clear covers, which still offers a crisp view of your printing underneath. They come in select sizes and are great for proposals of all kinds. • One-Piece Punchable Hard Covers: Nothing looks as impressive as a hard cover on your report. With these premium Klassic hard covers from Akiles, you can elevate your binding presentations to a whole new level. Plus, they can easily be punched with any binding pattern you need using most office-level punching and binding machines*. These turned edge hard covers feature a colored linen finish on the outside, and a matte beige inside liner. They are 2mm thick (or 80 mil) and rigid, so they will not bend, unless a strong pressure is applied. These hardback covers are perfect when paired with Wire-O binding in particular, but also work great with plastic coil spiral bindings and plastic comb binding as well. You can also 3-hole punch them with a paper drill and pair with loose leaf rings, or anything else you can think of. • Eco Chip Board Binding Covers: Chip board sheets come in a huge selection of sizes and thicknesses. They offer an environmentally friendly solution to plastic covers and coated paper covers that can't be recycled. They are available in a "natural" color, which can vary from brown to gray due to the fact that they are made from 100% recycled materials. You may also notice speckles within the chipboard for this reason, which makes every single piece unique. You can buy chip board sheets in several thicknesses, including 22, 24, and 30 point. The packaged quantity varies depending on the size and thickness. In addition to report covers, environmentally friendly chipboard paper is also used for other applications, such as the backing for pads of paper, notebook and journal covers, unique business cards, wedding place cards and invitations, gift tags and greeting cards, and crafts of many kinds. • Pre-Punched Binding Covers: We have several different kinds of cover sheets that are pre-punched for popular binding methods, including comb, spiral coil binding, wire-o twin loop bindings and more. These covers are great for users who have lower-level binding machines that don't punch thicker covers well, as well as those who just want to avoid the additional wear that cover sheets could cause to their machine. Having pre-punched report covers on hand can speed up production and ease strain on your operators. Choose from clear or vinyl covers. • GBC Designer Binding Covers: Popular with a select group of users, the GBC designer brand binding covers are available in either a globe/earth design or a deco cube design. Both are clear covers that show your 1st page through, but that also have decoration on the cover that adds something new. They are 16 guage thick poly, which is incredibly durable and sturdy, while still remaining flexible. • Side-Staple Binding Covers: These side staple wrap-around report covers from Coverbind offer a fast and convenient way to bind thin documents, without the need of any special equipment. Simply place your sheets into the wrap-around cover, and staple* the two tabs on the spine. These tab cuts-outs allow you to open your cover completely, without moving the pages with the cover; a unique feature compared to other wrap-around options. The back covers and spines are made of a premium 80 lb. textured linen, and are available in white, black, or navy blue. The front cover is a 7 mil clear matte finish, so you can see your first page through, without harsh glare. • Thermal Binding Covers: Thermal binding covers are proprietary,and will only work with their compatible thermal binding machines. However, they fall into the cover category because they are wrap-around covers for your pages. Thermal binding covers come in a large selection of cover styles, not just hard or soft covers. There are flexible wrap-around thermal bind covers that have clear fronts with linen spines and backs, or all linen wrap-around covers with window, as well as just a spine glue option that you can place into your own custom scored cover. The hard cover thermal binding covers also come in several options, including plain hard covers or hard covers with a window cut out on the front to show a portion of your first page through. In addition to these options, Coverbind brand thermal binding covers also have both hard and soft covers that you can actually customize in-house with any standard printer and no specialty equipment, putting the power to personalize premium presentations yourself.